Health Benefits of Turmeric | Probably the Healthiest Spice of Them All! 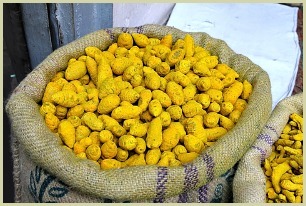 For centuries, this bright yellow spice has been a staple in kitchens across South Asia. And because of the many health benefits of turmeric, it has also been a staple for practitioners of ancient Ayurvedic medicine for more than two thousand years. This relative of ginger root is flavourful, colourful, and has become a key ingredient in Indian curries and samosas, and it’s even used to give a lovely colour to Indian cakes and desserts. ...making it a useful treatment for everything from arthritis to Alzheimer’s disease. The curcumin in turmeric acts as a natural antibacterial agent, cutting down on your risk of food poisoning. It can also be used to help clean minor cuts and burns, and to aid in the treatment of psoriasis. For external use, turmeric oil is particularly useful. Read more on its essential oil. 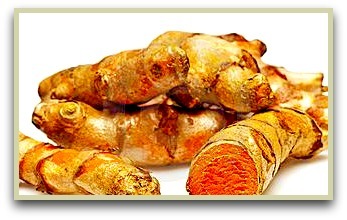 ...Are now looking at the health benefits of turmeric for Alzheimer’s patients. Early results have shown promise in removing some of the plaque build-up in the brain that exacerbates symptoms of Alzheimer’s. It is also showing promise in several new studies on halting the progression of multiple sclerosis. If you can get hold of it, the best way to enjoy the many health benefits of turmeric is to consume it fresh and add it to your food, where you can enjoy both the flavour and pleasant effects on the body. However, if you live in the West, you will probably use it in powder form and add it to your recipes or use it in homemade blends. You can even make a potent tea with the powder. Click for my recipe. ...turmeric supplements should not be taken by pregnant or breastfeeding women, anyone with gallbladder problems, or anyone about to have surgery or who has recently undergone surgery. Read more on turmeric side effects.